We like football in our family. My son, Sam, is an especially avid, loyal Seahawks fan and you can imagine how happy we’d all be if the Seahawks were in this year’s Super Bowl! Sigh, it was an exciting season, but it was not meant to be. Let’s hope for next year! So, on Super Bowl Sunday, we will be gathered around to watch the Ravens and 49ers play and will, of course, need to eat. My Super Bowl menu has evolved over the years to include deviled eggs, spicy Korean chicken wings, nachos (this year I’m making this Nacho Cheese Sauce) and our family chili – a thick, hearty bowl of simple beef, no beans. While I love veggie bean chili, sometimes the richness of beef is called for and that’s when I make this one. Back in the late ‘90s, Bob entered his company-hosted chili cook-off. 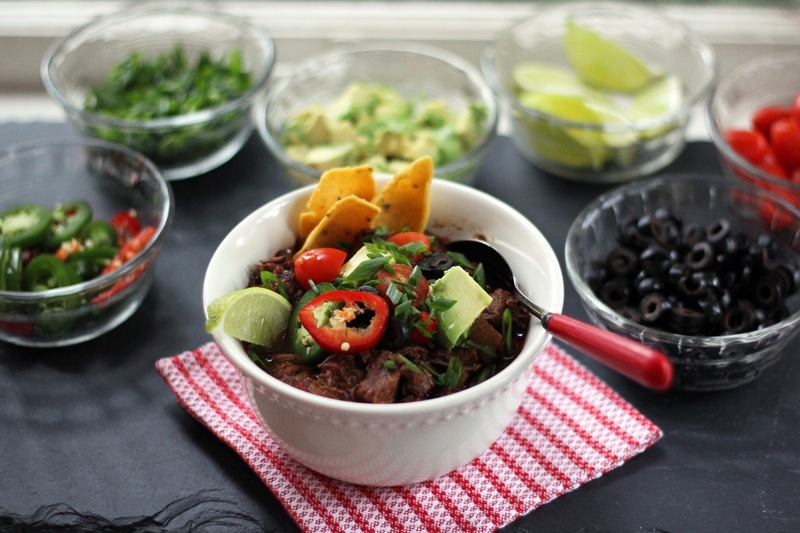 He and his buddy got together to create the ultimate meat chili. They wanted it to be pure beef. With beer. And spice and heat. But no beans. Now, I’m not kidding, this chili really is award winning! Judges came from CASI for the chili cook-off to taste and judge, and this chili won first prize for the meat category! I really wish I had a photo to share with you from the event, but this was back in my toddler-and-baby-days, and remembering a camera as we hustled out the door just didn’t happen. But what a thrill! This hearty chili recipe is now part of our family repertoire, and the only tinker we’ve made is to add tomatoes ... we just really like tomatoes in our chili. Oh, and I decreased the amount of beer scrawled in the original recipe (or maybe that was the amount the guys consumed while cooking the chili?). Making the chili couldn’t be easier as it’s done in the slow cooker. You could brown the meat and onions first in a frying pan if you’d like, but I prefer the ease of tossing everything into the crock pot, giving it a stir and leaving it to simmer all day. 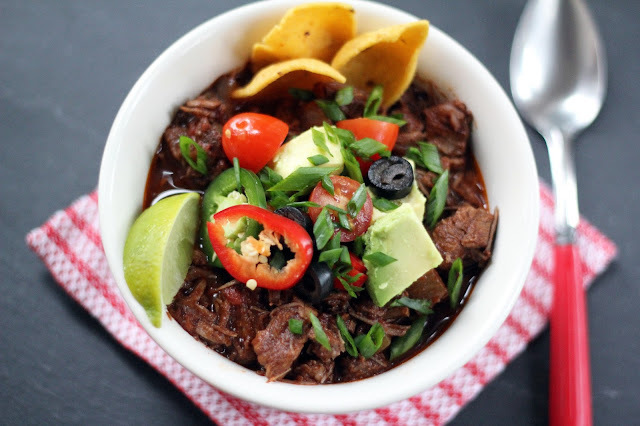 Fragrant spices, onions, garlic, chiles and tomatoes cook slowly with the beef, and it’s heavenly to come home to a house filled with the mouthwatering scent of chili. The beef becomes meltingly tender, and I use a couple of forks to shred and break up about half of the meat for a variety of textures. 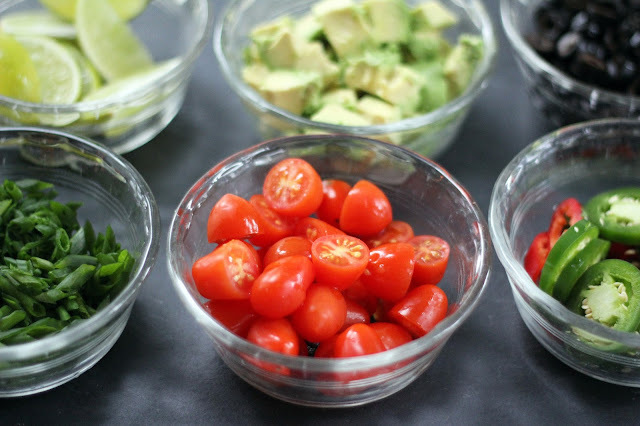 After scooping out a bowl of chili, be sure to have a toppings bar ready with green onions, corn chips, olives, avocadoes, sliced jalapenos and tomatoes. I like to add a squeeze of fresh lime to mine, too. Robust, with a nice buzz of spice and loads of flavor, this is one to settle back and enjoy on Super Bowl Sunday! Pull out your slow cooker. Add the beef, onion, garlic and spices and stir to coat. Add the jalapeno (s), beer, tomatoes and paste and stir gently to mix. Pop the lid on, set the cooker on high for 4-5 hours or low for 6-8 hours and walk away. 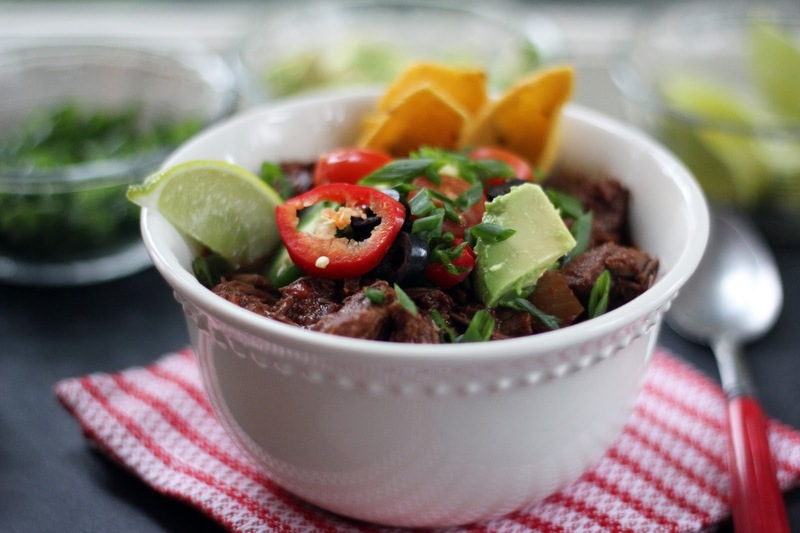 When ready to serve, use 2 forks to shred and carefully break up about half the chunks of meat (the beef will be so soft it will be easy to do). Serve the chili in bowls with toppings of your choice and enjoy! I’ve embarked on a culinary adventure. This is a new journey, one where I am cooking virtually with a community that shares a love for trying unique flavors and exploring a cookbook in depth. I couldn’t be happier! The inspiration for this group comes from two friends, Beth Lee of OMGYummy and Sarene Wallace. We are cooking from Jerusalem, the treasure of recipes created by Yotam Ottolenghi and Sami Tamimi. Each month, we’ll focus on a spice and some selected recipes, and share our experiences and what we’re learning as we cook. To kick off this first month, we’ve been cooking with sumac, a deeply red spice that is prevalent in Middle Eastern cooking and brightens dishes with its rather tart, lemony zip. It is sprinkled on top of Kohlrabi Salad, which was the first recipe I made from the book. Now, I’ve only bought kohlrabi once before and normally I would have paused over this recipe and then moved on to another since this is not a vegetable in my usual repertoire. Am I ever glad I made it! Before peeling and chopping the kohlrabi, I made sure to show the purple bulbs to my sons (to deepen their veggie education!). 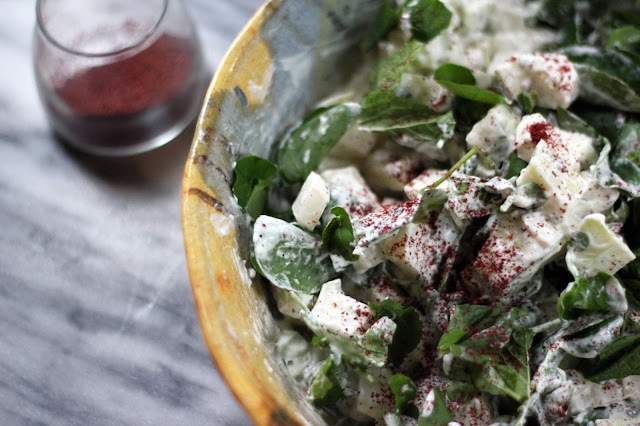 Its texture is crisp, like an apple, and when combined with refreshing mint, peppery watercress and a creamy dressing of yogurt, sour cream, mascarpone and sumac, it is dazzling. I am continually drawn to the ends of cookbooks now, where the condiment recipes are usually stashed. Condiments and other such fundamental recipes are the building blocks of so many dishes. If you have good quality sauces and such on hand, it’s a snap to put together a delicious meal in no time or add a bit of flourish. Jerusalem does not disappoint! 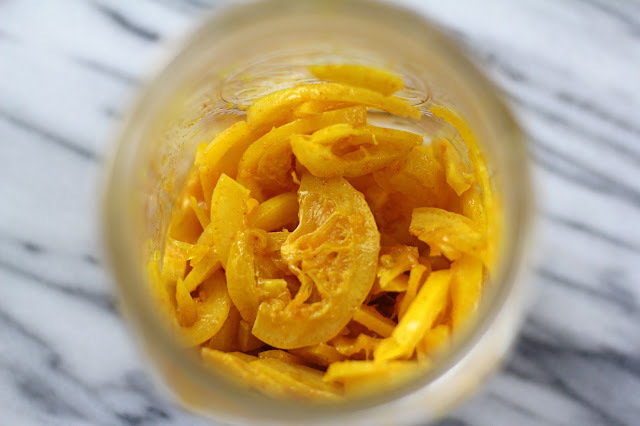 In order to prepare the Braised Eggs with Lamb, Tahini and Sumac, I saw I would need preserved lemons and harissa. Yes! Preserved lemons take some time (about 5 weeks), so I quickly salted some lemons and started the process. But in the meantime, I still wanted to make this lamb recipe. So I also happily pickled some lemons overnight with red chile, salt, garlic and other spices. I’m finding lots of ways to use these lemons (tuna salad!) and I’ll be making them again and again. And then there is harissa ... this one’s a winner. Red peppers and chiles, coriander, cumin and caraway toasted and ground, garlic and lemon - harissa has it all and pops with taste. I made a double batch knowing we’d fall in love with it, and next time I’ll be tripling it. With the condiments prepared, the Braised Eggs with Lamb comes together quickly. 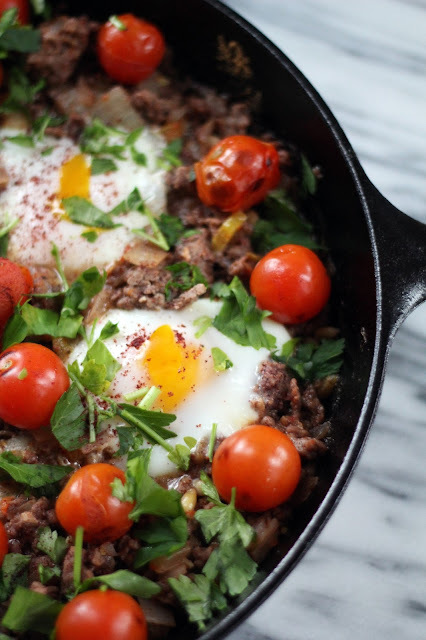 Ground lamb, onions and garlic are sautéed and seasoned with sumac and cumin, then harissa and pickled lemons add a punch of flavor - a little tart, a little spicy. Braising the eggs in this mixture reminded me a bit of cooking eggs in tomatoes and peppers for shakshuka (another incredible dish). Charred tomatoes and more sumac top off the dish beautifully. There were many happy sighs as we ate dinner that night! If you’d like to make Braised Eggs with Lamb the recipe can be found here. It is such a pleasure to learn, share and discover together. I can’t wait for next month! If you’d like to join us in cooking or follow along, please do! 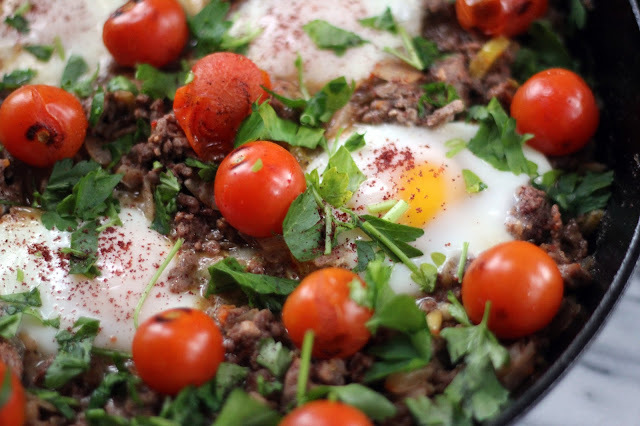 Tasting Jerusalem is a virtual cooking community exploring the vibrant flavors and cuisine of the Middle East through the lens of Jerusalem: A Cookbook by Ottolenghi and Tamimi published by Ten Speed Press. You can follow along and cook with us by subscribing to omgyummy.com, following the hashtag #TastingJrslm on Twitter and Instagram, and liking our Facebook page. While it’s too early for buds to be appearing here, in Israel the fruit trees are beginning to awaken from their winter slumber. This time of season signifies the arrival of Tu B’Shevat (the 15th day of the Hebrew month of Shevat), the agricultural holiday marking a new year for trees. I just love this celebration of nature and recognizing the trees’ cycle of life. In Israel, the festival has evolved to include planting new trees, as well. 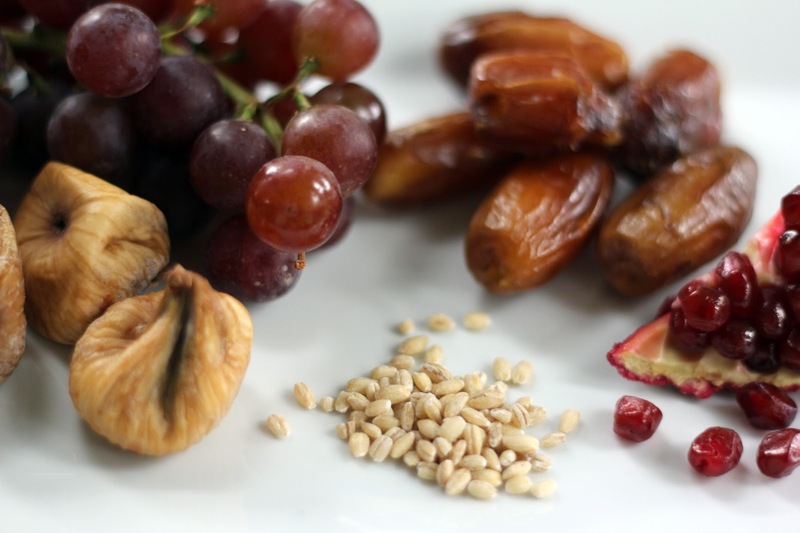 On this day, it’s traditional to eat foods made from fruit and nuts, especially the seven species of Israel - olives, dates, wheat, barley, pomegranates, grapes and figs. With this in mind, I wanted to create a salad that highlights these traditional species. I started with barley. Barley is a rather quiet grain and doesn’t get a lot of fanfare, other than in mushroom barley soup. 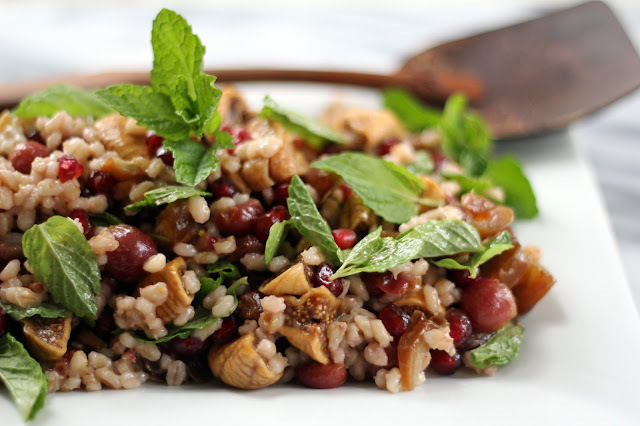 I appreciate barley’s chewy texture and earthy flavor and I thought it would shine in a salad. Roasted grapes are unbelievably good. While I am not really a grape fan, I’ll happily eat a pan of these. The heat transforms the grapes and a flavor emerges that is much more interesting to me. A simple drizzle of olive oil and quick roast softens the grapes and releases their juices, which mix with the oil and create the dressing for this salad. 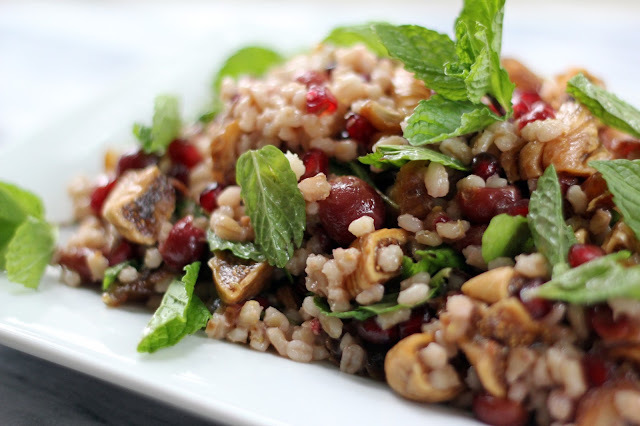 Tart, crunchy pomegranate arils and sweet dates and figs add texture and color, while fresh mint and lemon zest bring a bright finish to the salad. This one is bursting with flavor! And it provides a nice balance to the heavy stews we are still eating during our chilly, damp season. We can savor this salad and dream about warm sunshine and flowering trees ... soon enough. In a medium sized sauce pan, melt the butter over medium heat and add the barley. Stir to coat with butter and sauté until the grains are toasted and a bit browned, about 3 minutes. Pour in the 2 cups of water, raise the heat and bring to a boil. Give the barley a stir, cover, lower the heat and simmer until the barley is soft but still has a bit of a chewy bite, about 30 minutes. Remove from heat and set aside, uncovered. While the barley is cooking, preheat the oven to 375 degrees. Pour 1 tablespoon of olive oil on a rimmed baking sheet and add the grapes. Roll the grapes around to coat them in the oil. 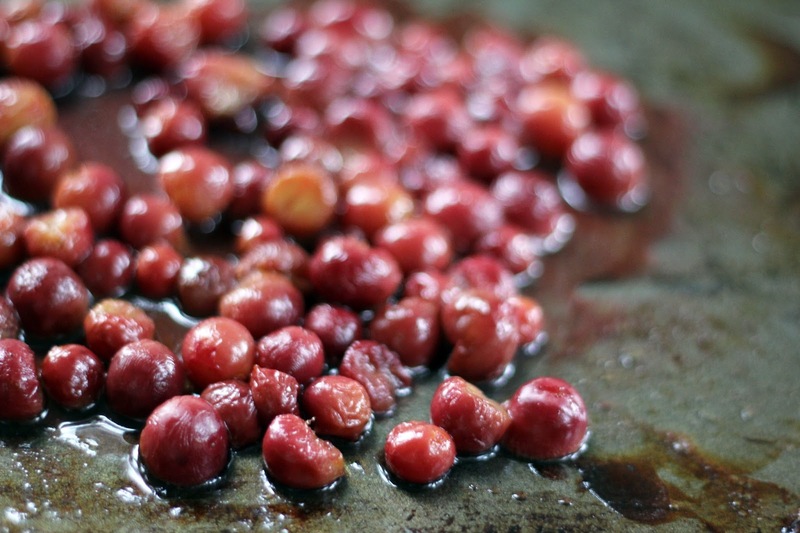 Roast the grapes for about 15 minutes, until they are soft and sweet and release their juices. Remove from the oven and set aside to cool. In a serving bowl, scoop the barley in and gently stir in the lemon zest and salt. Add the pomegranate arils, dates and figs. Scrape the roasted grapes and collected juices/olive oil into the bowl and gently mix together. Scatter the mint leaves over the salad and fold them in. This salad can be made a few hours ahead. Cover and let sit at room temperature until ready to eat. Little pots of soft, warm chocolate are just right to end an elegant dinner. Or for that matter, a casual, simple meal of soup and salad. No need to wait for a festive party before making Chocolate Soufflés! 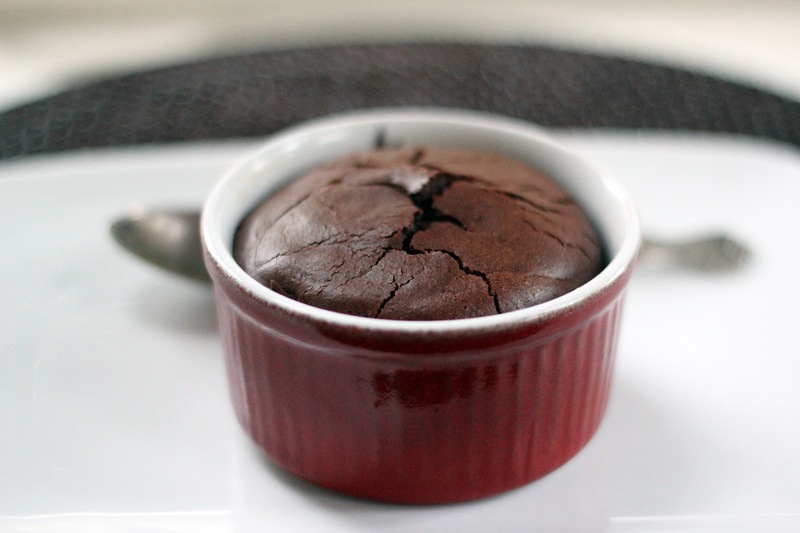 I have been making these little soufflés for years. Their pure, deep dark chocolate taste appeals to me, particularly the way it is intensified by the addition of unsweetened chocolate and espresso powder. I often add a bit of espresso powder to chocolate desserts as it complements the chocolate flavor beautifully without overpowering. 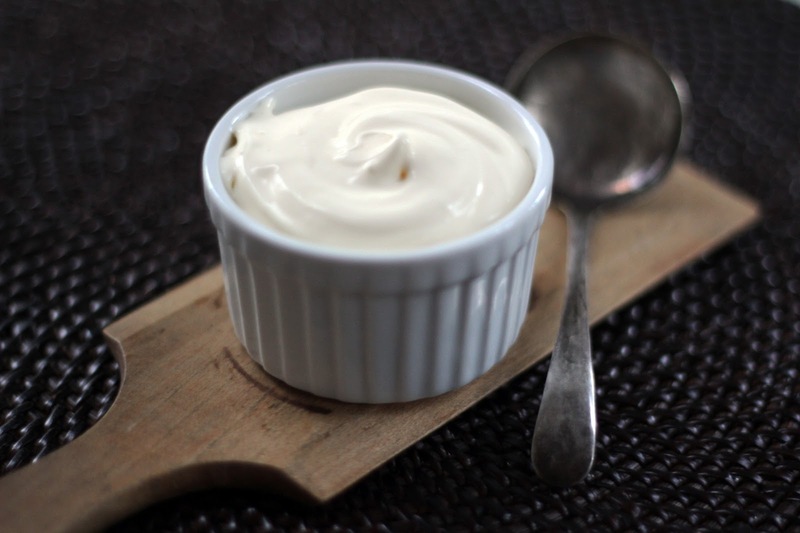 Recently, I made homemade crème fraiche for the first time and am shaking my head that I didn’t do this sooner. A bit of yogurt stirred into heavy cream turned it thick, rich, tangy and decadent overnight – what a smile I had in the morning! 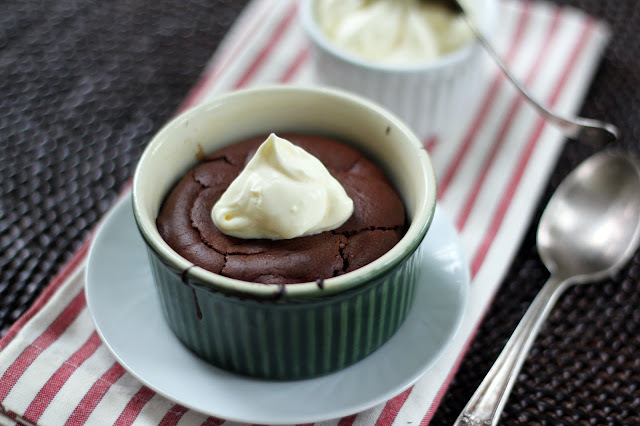 So easy and delicious, and a dollop adds just the right finishing touch to chocolate soufflé. The soufflés can be made ahead of time and kept in the fridge or freezer. When ready to bake, just pop them into the oven. The soufflés emerge puffed and pretty from the oven and ready to serve. 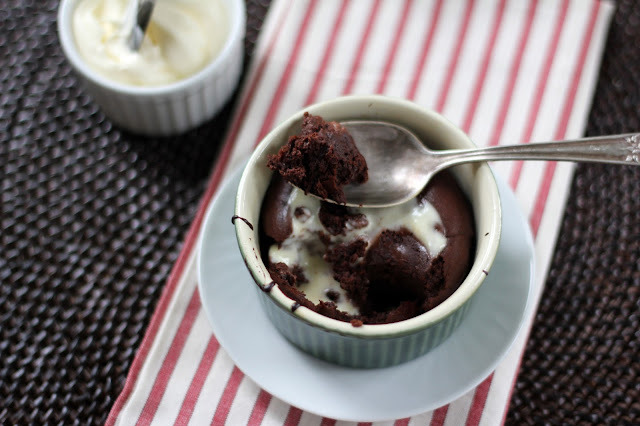 Dip your spoon in and watch the little bursts of steam escape from the soufflé and the crème fraiche melt into the luscious chocolate. Savor the light, airy texture of the soufflés together with the rich cream – it is pure heaven and creates a special occasion, whether for a dinner party or weeknight supper. Butter 8 ramekins and place them on a rimmed baking sheet. Set aside. In a large saucepan, melt the butter over medium heat and add the flour. Stir to mix. Slowly whisk in the milk and cook until it begins to thicken, about 2 minutes, stirring constantly. Remove pan from the heat. Add the dark and unsweetened chocolates, espresso powder, vanilla and 3 tablespoons sugar. Whisk until it is melted and smooth. Let cool to room temperature. You can keep the chocolate mixture in the saucepan. 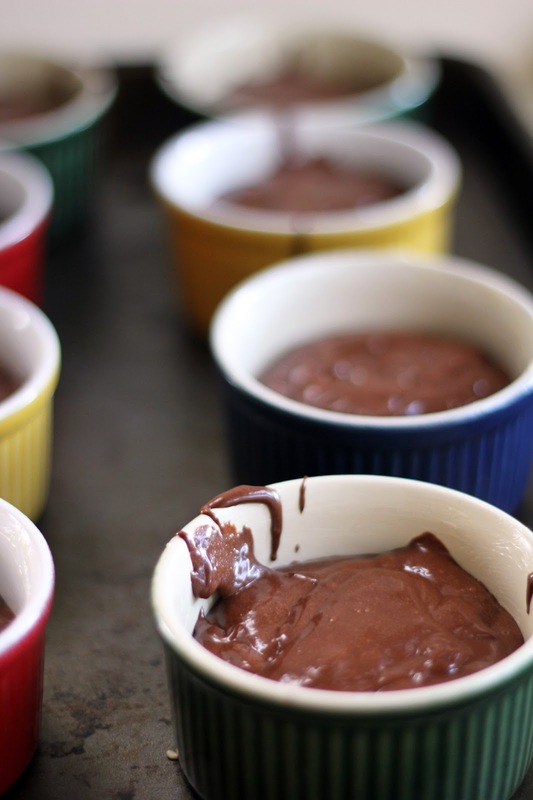 Whisk the egg yolks into the chocolate mixture. With an electric mixer, beat the egg whites and salt in a medium bowl until soft peaks form. Slowly add the remaining 2 tablespoons sugar and beat until glossy (do not over mix, though – no lumps). Fold 1/4 of the egg whites into the chocolate mixture. Fold in the remaining whites very gently. Divide the soufflé mixture between the 8 ramekins. At this point, you can cover the ramekins and either freeze for 2 weeks or pop in the fridge for a couple of days. Preheat the oven to 400 degrees. 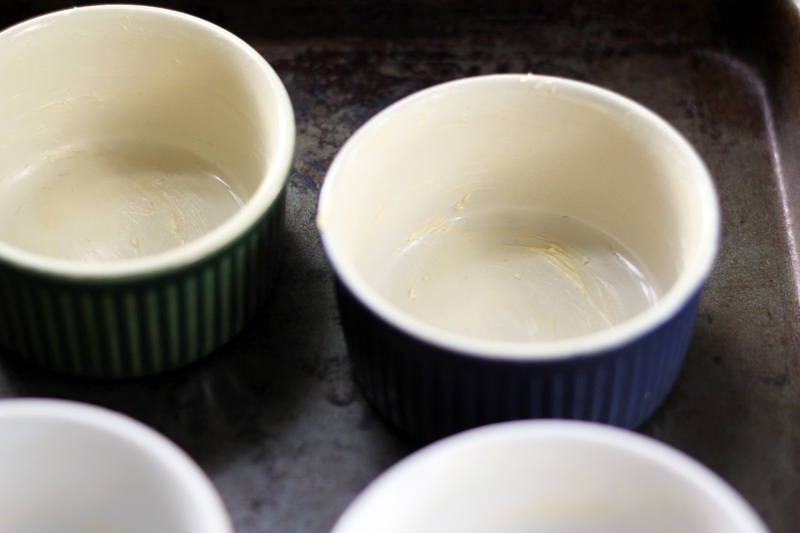 Bake the soufflés on the rimmed baking sheet until puffed and centers begin to crack, about 17 minutes for fresh or chilled soufflés or 22 minutes for frozen. Serve immediately with crème fraiche. Stir the cream and yogurt or buttermilk together in a bowl. Cover and let sit out on your kitchen counter for 12-24 hours until it reaches desired consistency. This will depend upon how warm your kitchen is – the warmer it is, the quicker it will thicken. Store it in your fridge and start dolloping. It will keep for a few weeks. 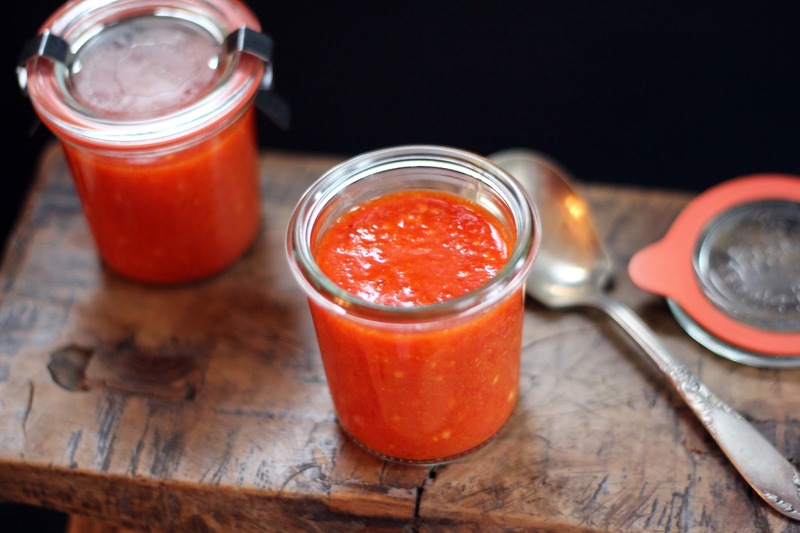 A couple of years ago I got hooked on homemade sriracha. I had discovered a recipe on Food52 and made it immediately. Upon tasting the homemade sauce, my family and I declared it superior to the store-bought sriracha which we immediately tossed out in favor of our new favorite. 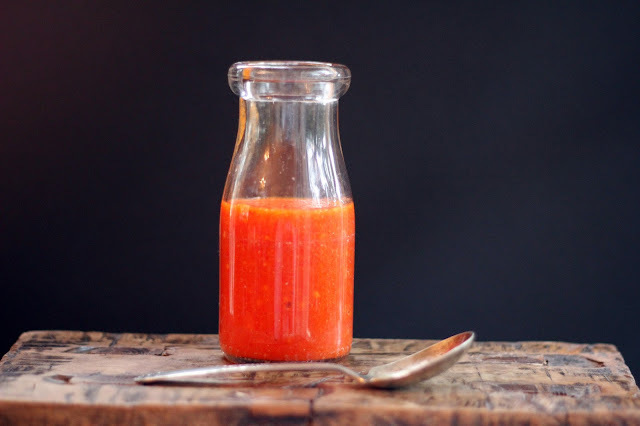 This experience opened my eyes to the world of homemade condiments, and sriracha became my gateway condiment, if you will. Here at Blue Kale Road, I love telling you about new creations as well as family recipes, and sriracha has become a family recipe. It is one of those repertoire recipes, one without which my boys will not leave home. 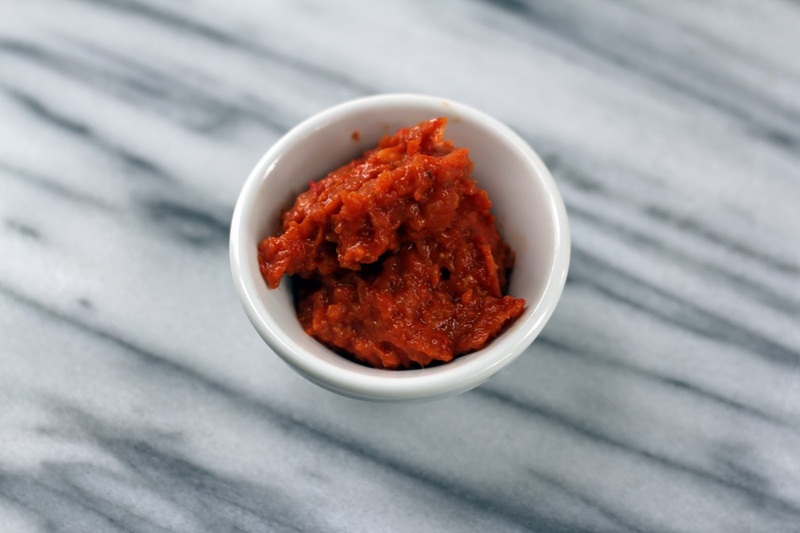 We are never without a jar in the fridge, and I can’t begin to tell you all the times we have dolloped and slathered this fiery red sauce. I’ve seen quite a few variations of sriracha made in home kitchens, some are cooked, others fresh, some have fish sauce, while others have tomatoes. But they all share chiles, vinegar, garlic, salt and a sweetener, and I have stuck with these basics. I have stayed close to the original recipe I first discovered, making only a few little tweaks. After a whirl in the blender, the combination of red fresno chiles and garlic creates a sauce with heat and spice, balanced with bright flavor from apple cider vinegar and a touch of honey sweetness (which I used in place of the original white vinegar and brown sugar). I truly can’t get enough of this stuff. The clean, fresh, vibrant flavors will make your taste buds sing, and it packs a punch! Mix a dab with creamy egg yolks for a twist on deviled eggs, stir a bit into mayo for a zesty sandwich spread or quick dip, or simply dollop away on eggs, rice or anything you’d like to jazz up. 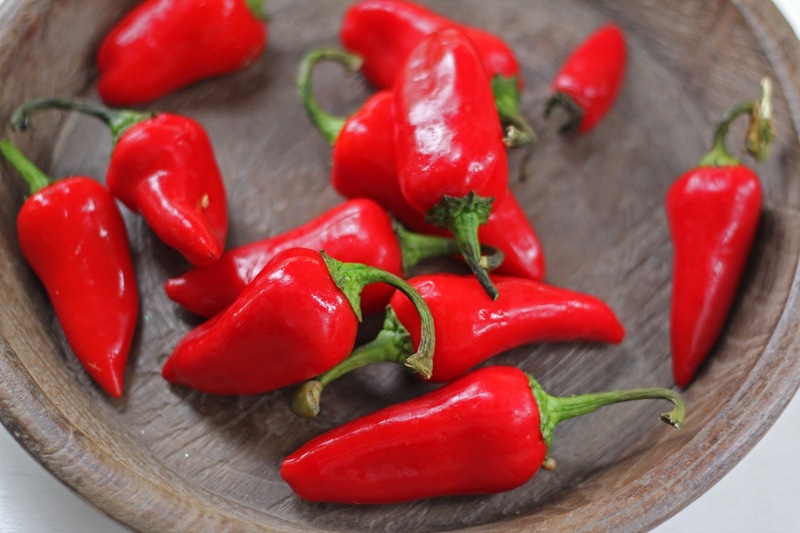 Just be prepared to keep fresno chiles on your regular shopping list. 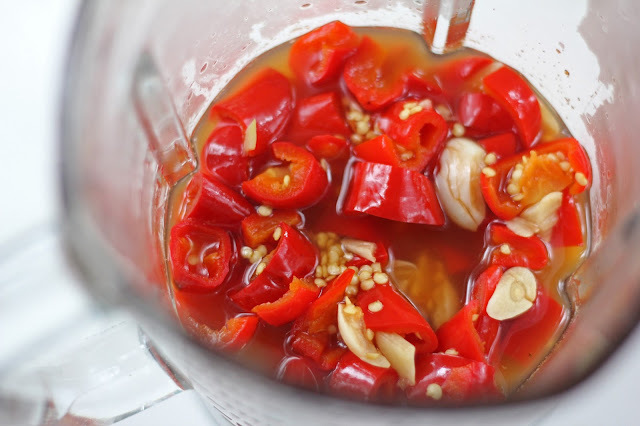 In a large jar, combine the sliced chiles (and seeds), garlic, kosher salt and cider vinegar. Screw the lid on and give a few little shakes to mix. Leave the mixture to sit on the counter overnight. When cool, pour the mixture into a blender and puree until very smooth (this will take a few minutes). Stop and scrape the sides down a couple of times. 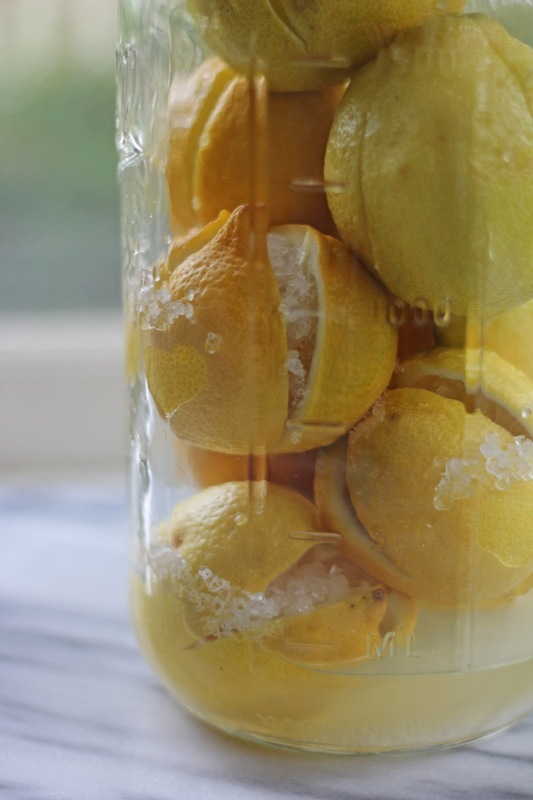 Pour into a jar and pop it into the fridge, where it will keep for up to one month. Happy 2013! I hope the holiday season was good to you, with plenty of time spent with loved ones. Our time was happily filled with a visit to see family and friends, a lovely wedding, many games of Banagrams, many episodes of Boardwalk Empire, sledding, cooking from Burma, reading and eating peppermint bark and popcorn. And, of course, the return of Downton Abbey last night. Over the winter break, I reminisced about our trip to Australia during the same time last year, and this lead to thoughts of Pavlova, which is very popular during the Christmas season there (large meringues are readily available in the grocery stores). I’ve shared my love of cream and meringue desserts before, and Pavlova is another such creation - an old favorite for a new year. Egg whites are whipped with sugar until they are snowy white and then mounded with softly muffled glumpf sounds onto a baking pan and swirled into a round. When baked, I’ve noticed that sometimes the meringue stays white and sometimes it becomes golden, which reminds me of a nicely toasted marshmallow - not a bad thing! Billows of whipped cream are then spread over the meringue and topped with fruit. Passion fruit is traditional (we ate the best passion fruit ever in Australia), but I chose to use some beautiful pomegranates which are in season now. 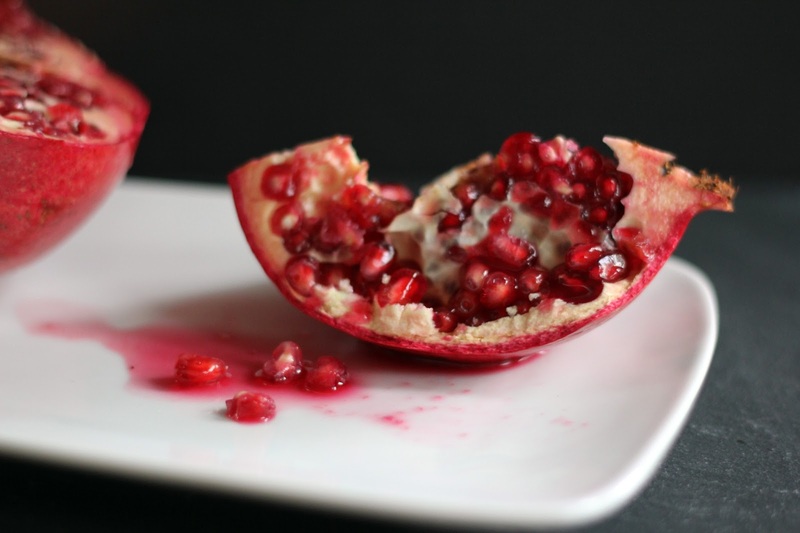 Pomegranate arils are so pretty, like little jewels, and their ruby color is striking against the white cream, their crimson juice staining it pink. They burst with tart flavor as you take a bite of this light, airy confection. The soft crunch of meringue melts in your mouth. This is one magical dessert. 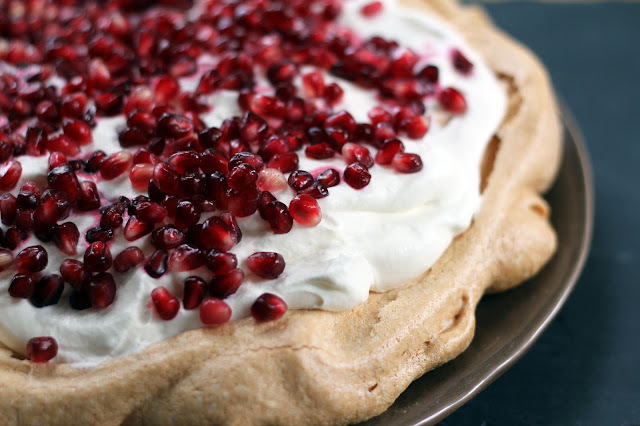 Pavlova is stunning, perfect for a holiday celebration or an elegant dinner party. Or, in our case, a family dinner where we blissfully devoured the whole thing, winter break stretching luxuriously ahead of us. Now we have a shiny new year ahead filled with new possibilities. I am looking forward to a delicious, creative 2013 with lots of joy, both in and out of the kitchen. Wishing you the same, as well! Preheat the oven to 350 degrees. Draw a 9 inch circle on a piece of parchment paper and place it on a baking sheet. In a glass measuring cup, stir together the cornstarch, white vinegar and 1 teaspoon of vanilla. Set aside. 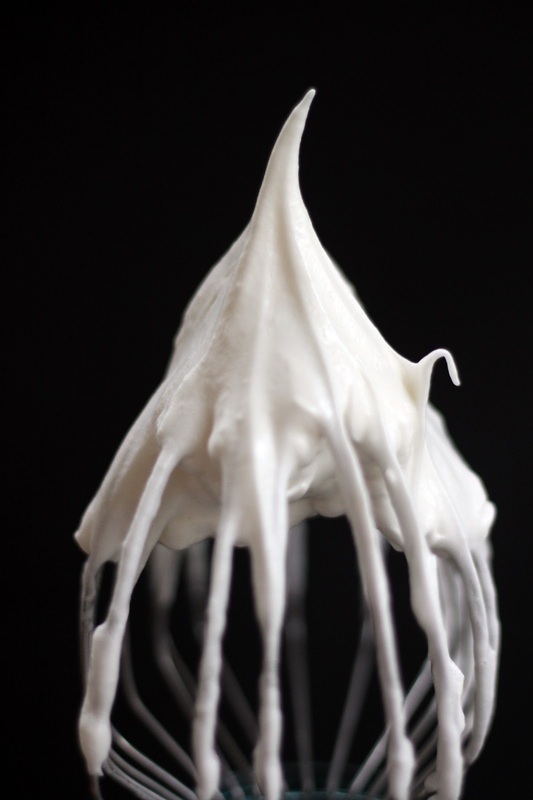 Using an electric mixer or stand mixer with a whisk attachment, beat the egg whites on high speed with a pinch of kosher salt until soft peaks begin to form. Lower the speed a little and slowly add 1 cup of sugar. Pour in the cornstarch mixture. Whisk until well mixed. The egg whites should be smooth and billowy, be sure not to over mix them. Gently spoon the egg whites onto the baking sheet and smooth to fill the circle. Place the baking sheet in the oven and lower the heat to 300 degrees. Bake for 1 hour, then decrease the heat to 180 degrees for 1/2 hour. The meringue should be puffed and lightly golden. Turn the heat off and leave the meringue to cool in the oven with the door closed. It can be prepared the night before and left in the closed oven until the next day. When ready to serve, whip the chilled heavy cream until soft peaks form. Add the remaining 1/2 teaspoon vanilla and 1 tablespoon of sugar and beat until mixed. Peel the parchment paper off the meringue and place on a flat serving plate. Dollop the whipped cream over the top and smooth. 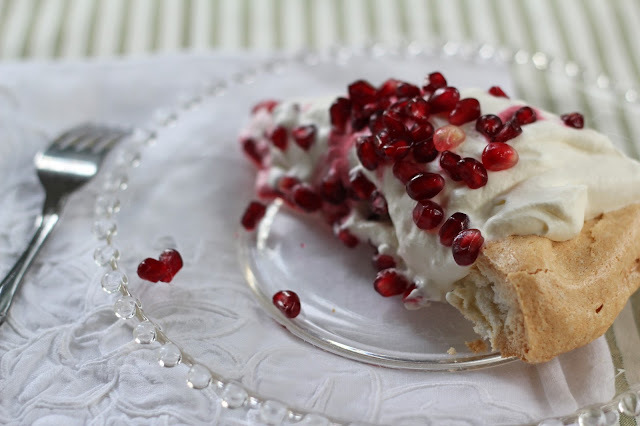 Scatter the pomegranate arils and any collected juices over the cream. Bring to the table and serve in slices.